Toasted pecans make a crispy coating for baked salmon in this quick fish recipe. 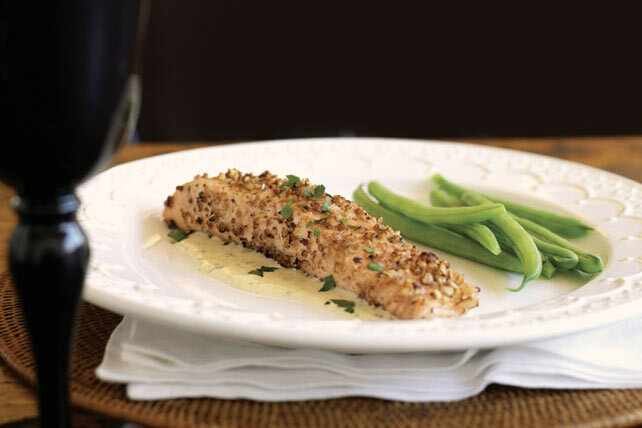 Served with a creamy white wine sauce, this Pecan-Crusted Salmon is perfect for everyday entertaining. Preheat oven to 400ºF. Brush flesh side of salmon with dressing; press into pecans until evenly coated. Place, pecan-sides up, on foil-covered baking sheet. Bake 13 to 15 min. or until salmon flakes easily with fork. Meanwhile, beat cream cheese product and wine in small saucepan with wire whisk until well blended. Cook on medium-low heat 3 to 5 min. or until cream cheese product is completely melted and mixture is well blended, stirring frequently. Spoon cream cheese sauce evenly onto four serving plates; top with salmon. Sprinkle with parsley. Serve with garlic green beans and hot mashed potatoes. Substitute toasted hazelnuts for the pecans. This recipe easily doubles to make 8 servings. Just prepare as directed, doubling all ingredients.